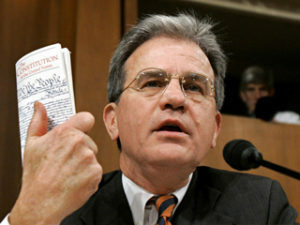 WASHINGTON — Last week, Tom Coburn announced his resignation at the end of this next legislative session. Coburn is one of the Oklahoma U.S. Senators and is known for his conservatism in the Senate body. NewsOK reported that Coburn’s resignation was not influenced by his health problems, as he is currently battling prostate cancer. Coburn has served a combined fifteen years in Congress and focused on eliminating government waste and the government debt. His resignation comes two years before his term ends, but as NewsOK said, it allows his replacement to be elected during the “regular ballot process”. It will be a shortened election race, but has no shortage of potential candidates such as congressmen James Lankford or Jim Birdenstine. Other potential candidates, congressman Tom Cole and Oklahoma Attorney General Scott Pruitt, declined to run for the seat. Coburn’s senatorial colleague, Jim Inhofe, is also running for re-election in this cycle. “Serving as Oklahoma’s senator has been, and continues to be, one of the great privileges and blessings of my life. But, after much prayer and consideration, I have decided that I will leave my Senate seat at the end of this Congress. “Carolyn and I have been touched by the encouragement we’ve received from people across the state regarding my latest battle against cancer. But this decision isn’t about my health, my prognosis or even my hopes and desires. My commitment to the people of Oklahoma has always been that I would serve no more than two terms. Our founders saw public service and politics as a calling rather than a career. That’s how I saw it when I first ran for office in 1994, and that’s how I still see it today. I believe it’s important to live under the laws I helped write, and even those I fought hard to block. “As a citizen legislator, I am first and foremost a citizen who cares deeply about the kind of country we leave our children and grandchildren. As I have traveled across Oklahoma and our nation these past nine years, I have yet to meet a parent or grandparent who wouldn’t do anything within their power to secure the future for the next generation. That’s why I initially ran for office in 1994 and re-entered politics in 2004. I’m encouraged there are thousands of Americans with real-world experience and good judgment who feel just like I do. As dysfunctional as Washington is these days, change is still possible when ‘We the People’ get engaged, run for office themselves or make their voices heard. After all, how else could a country doctor from Muskogee with no political experience make it to Washington? “As a citizen, I am now convinced that I can best serve my own children and grandchildren by shifting my focus elsewhere. In the meantime, I look forward to finishing this year strong. I intend to continue our fight for Oklahoma, and will do everything in my power to force the Senate to re-embrace its heritage of debate, deliberation and consensus as we face our many challenges ahead.